Helicopter Flight over St. Petersburg is included into this tour! This is a unique experience of a lifetime! 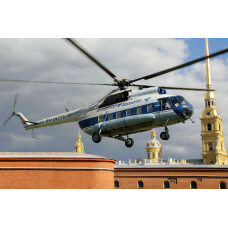 We offer you to book a Helicopter City Tour and to enjoy the beauty of Saint-Petersburg from bird's-eye view! The tour starts at the hotel. Our driver will take you to the helipad where you get in a helicopter with a professional pilot. You´ll also be accompanied by our guide. During the 30-minute flight you'll be enjoying the picturesque views of the city, you will see the Finland Gulf, Neva River, Spit of the Basil Island, Peter and Paul Fortress and Cathedral, Palace Square, St. Isaac's Cathedral, Church of the Savior on Blood and other famous landmarks of the city.